Anne has always loved beautiful things, her favorite being antique jewelry. In the early 1980's, after spending many years learning about and collecting antique jewelry, she realized that there was a need for affordable, vintage inspired styles. Collecting and wearing these vintage designs made her feel unforgettable, and she wanted other women to feel unforgettable, too. Anne’s mother, Sally, had been a millinery designer during the 1920’s. She was the perfect resource for Anne, and she encouraged her to go to 37th Street in NYC to nd jewelry supplies. It was in one of those bead houses on 37th Street where she picked up her rst pair of rosary pliers. She didn’t have to be taught how to use them, she instinctively knew. From there she purchased her rst glass beads, chain and ndings then went to her Long Island home to craft a doz- en necklace and earring sets on her dining room table. Anne’s sis- ter, Ilene, offered those very rst pieces in her Cedarhurst, NY bou- tique. In no time, it was clear how much her designs were adored, because in 3 days every piece was sold...and Anne soon thereaf- ter found herself in the middle of the fashion jewelry industry. 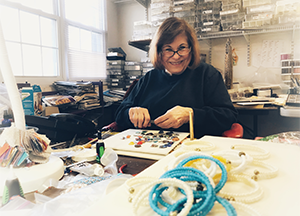 Today, Anne Koplik jewelry collections are proudly designed and handcrafted in their Brewster, NY studio. Anne and her team of skilled American artisans handcraft vintage inspired jewelry with crys- tals from Swarovski®. Each piece of jewelry is created for women who want to experience beautiful antique-inspired designs and have them for their own, at an attainable price. One of Anne’s greatest joys is that she works side by side with both of her daughters Jill and Kara. Together they oversee all aspects of the business. She also loves that as she designs each piece, her golden retriever, Sonny, relaxes by her feet, on the purple oors that she installed throughout her workshop. Purple has always been one of Anne’s favorite colors. Anne's jewelry is worn by many of Hollywood’s elite. Anne Koplik jewelry has been the exclusive provider of jewelry for Dancing with the Stars since Season 5. The jewelry has also been featured at the American Music Awards, Daytime Emmy Awards, Tony Awards, The Wendy Williams show, The Home and Family Network, Entertainment Tonight, and The Insider. Fashion editorial coverage includes prominent magazines such as InStyle, Lucky, Modern Bride, Good Housekeeping, and Women’s Wear Daily.